One of the most influential business books ever written is a 1200-page novel published 50 years ago. The 1957 novel Atlas Shrugged is Ayn Rand's glorification of the right of individuals to live entirely for their own interest. For years, Rand's message was attacked by intellectuals who argued that individuals should also work in the service of others. But the book attracted a coterie of fans. One of Rand's most famous devotees is Alan Greenspan, the former chairman of the Federal Reserve, whose memoir, The Age of Turbulence, will be officially released September 17. Mr. Greenspan met Rand when he was 25 and working as an economic forecaster. She was already renowned as the author of The Fountainhead, a novel about an architect true to his principles. Shortly after Atlas Shrugged was published in 1957, Mr. Greenspan wrote a letter to The New York Times: "Atlas Shrugged is a celebration of life and happiness. Justice is unrelenting. Creative individuals and undeviating purpose and rationality achieve joy and fulfillment. Parasites who persistently avoid either purpose or reason perish as they should." The book was released to terrible reviews. Critics faulted its length, its philosophy and its literary ambitions. Both conservatives and liberals were unstinting in disparaging the book; the right saw promotion of godlessness, and the left saw a message of "greed is good." Rand is said to have cried every day as the reviews came out. Darla Moore, vice president of the private investment firm Rainwater Inc. and a benefactor of the University of South Carolina, spoke of her debt to Rand in 1998. Rand's idea of "the virtue of selfishness is a harsh phrase for the Buddhist idea that you have to take care of yourself." James M. Kilts, who led turnarounds at Gillette, Nabisco and Kraft, said he encountered Atlas Shrugged in college. He found her writing reassuring because it made success seem rational. "Rand believed that there is right and wrong," he said, "that excellence should be your goal." Every year, 400,000 copies of Rand's novels are offered free to Advanced Placement high school programs, paid for by the Ayn Rand Institute. Last year, bookstores sold 150,000 copies of the book. Ayn Rand's two most famous novels The Fountainhead (1943) and Atlas Shrugged (1957) are among the greatest word-of-mouth hits in American publishing. Both were scorned by the critics when they came out, went on to become enormous best-sellers. The reason for the books' success probably has less to do with their novelistic merits than with the way they package in fictional form a philosophy Rand called Objectivism, which in effect turned the Judeo-Christian system on its head. In Rand's view, selfishness was good and altruism was evil, and the welfare of society was always subordinate to the self-interest of individuals, especially superior ones. Rand was born in 1905 in Russia. Her life changed overnight when the Bolsheviks broke into her father’s pharmacy and declared his livelihood the property of the state. She fled the Soviet Union in 1926 and arrived later that year in Hollywood. She sold several screenplays and intermittently wrote novels. After Rand's death in 1982, the books continue to be rediscovered and passed from one initiate to another. Among the many people influenced by Rand are Camille Paglia, Hugh Hefner, Alan Greenspan and Angelina Jolie. Our country is having an Atlas Shrugged moment. Trapped coal miners in Utah, smashed levees in New Orleans, busted steam pipes and flooded subways in New York City, a collapsed bridge over the Mississippi River in Minnesota, an air-traffic-control system stressed to its break point. Could this really be a description of the most prosperous country on the planet? The thing to remember about Atlas Shrugged is that the country was disintegrating in front of the eyes of our various capitalist heroes. The rail lines in particular were in peril in this 1957 book, a turgid ode to selfishness nonetheless considered a masterpiece by Rand's followers, who call themselves Objectivists. In Atlas Shrugged, society was falling apart because the elites weren't allowing the markets to function. A drumbeat of deadly railroad accidents punctuated and emphasized the calamity. Cut to the present. Barely a day goes by that some disaster or another doesn't strike, usually having nothing to do with any natural act. Might it be that greedy capitalists, comfy in their private jets and third, fourth and fifth vacation homes, aren't paying attention to the national infrastructure that they don't think they need to use? As for the political leadership, infrastructure spending is one of those rare instances where President Bush's take is spot-on correct. The president chastised Congress for favoring attention-getting new projects over boring maintenance needs. Today's Randians have an answer to our woes: Privatize everything. No way a bridge falls if a profit-seeking company, properly incentivized, had been charged with maintaining it. But that's dangerous thinking. There are certain things the market just can't be trusted to handle. The markets don't always work for the public good. Just ask CEOs of mortgage lenders that pushed no-documentation loans. The solution is to make government work better. Atlas Shrugged set off an intellectual shock wave that is still felt today. Many readers say it transformed their lives. A 1991 poll rated it the second-most influential book (after the Bible) for Americans. At one level, Atlas Shrugged is a steamy soap opera fused into a political thriller. At nearly 1,200 pages, the epic is merely the vehicle for Ms. Rand's philosophical ideal: "man as a heroic being, with his own happiness as the moral purpose of his life, with productive achievement as his noblest activity, and reason as his only absolute." Rand is honored as the modern fountainhead of laissez-faire capitalism, and as an impassioned, uncompromising, and unapologetic proponent of reason, liberty, individualism, and rational self-interest. I applaud her effort to counter the negative image of big business as robber barons. Her entrepreneurs are high-minded, principled achievers. Rand rightly points out that these enterprising leaders are a major cause of economic progress. History is full of examples of "men who took first steps down new roads armed with nothing but their own vision." But there's a dark side to Rand's teachings. Her defense of greed and selfishness, her diatribes against religion and charitable sacrificing for others who are less fortunate, and her criticism of the Judeo-Christian virtues have tarnished her advocacy of unfettered capitalism. Rand is truly revolutionary because she makes the first serious attempt to protest against altruism. She rejects the heart over the mind and faith beyond reason. Indeed, she denies the existence of any god or higher being, or any other authority over one's own mind. For her, the highest form of happiness is fulfilling one's own dreams, not someone else's. Rand makes a key point about altruism. A philosophy of sacrificing for others can lead to a political system that mandates sacrificing for others. That leads to a dysfunctional society of deadbeats corrupted by benefits and unearned income, who tax the productive citizens to pay for their pet philanthropic missions. But is the only alternative to embrace Rand's philosophy of extreme self-centeredness? No. If society is to survive and prosper, citizens must find a balance between the two extremes of self-interest and public interest. Adam Smith, the founder of modern economics, may have found that Aristotelian mean in his system of natural liberty. In The Theory of Moral Sentiments, he identifies sympathy or benevolence toward others in society. In his later work, The Wealth of Nations, he focuses on self-interest, which he defines as the right to pursue one's own business. Both, he argues, are essential to achieve "universal opulence." Smith's theme echoes his Christian heritage, particularly the golden rule. The golden rule is the correct solution in business and life. In 1991, the book-of-the-month club conducted a survey asking people what book had most influenced their lives. The Bible ranked number one and Ayn Rand's Atlas Shrugged was number two. In 1998, the Modern Library released two lists of the top 100 books of the 20th century. One was compiled from the votes of the Modern Library's Board. The two top-ranked books on the Board's list were Ulysses and The Great Gatsby. The other list was based on more than 200,000 votes cast online by anyone who wanted to vote. The top two on that list were Atlas Shrugged and The Fountainhead. The two novels have had six-figure annual sales for decades, running at a combined 300,000 copies annually during the past ten years. In 2009, Atlas Shrugged alone sold a record 500,000 copies and Rand's four novels combined sold more than 1,000,000 copies. Who was this woman? How did she come to write such phenomenally influential novels? What are we to make of her legacy? These questions have been answered in two new biographies published by Jennifer Burns, an assistant professor of history at the University of Virginia, and by Anne C. Heller, a former executive editor at Condé Nast Publications. In both accounts, the vibrant, brilliant woman of ideas shines through. Hour after hour the talk would continue in her New York apartment during the 1950s, sometimes all night, with Rand surrounded by her acolytes. Charismatic is an overused word, but with Rand, it fits. But Rand made a big deal about living a life that was the embodiment of her philosophy. As both books document, that statement was self-delusion on a grand scale. After 1957, Rand and her chief disciple Nathaniel Branden converted the themes of her novels into a philosophy that they labeled Objectivism. Its metaphysical foundation is the existence of reality that is unchanged by anything that an observer might think about it — "A is A." Its epistemology is based on the capacity of the human mind to perceive reality through reason, and the adamant assertion that reason is the only way to perceive reality. In Russia, Rand was born Alissa Rosenbaum in 1905, spent her childhood as the daughter of a prosperous Jewish pharmacist in pre-Revolutionary St. Petersburg, experienced the Bolshevik Revolution as a teenager, and graduated from university in Lenin's new USSR. Little Alissa, nicknamed Ayinotchka and sometimes called Ayin by her father, was a brilliant but socially awkward child who found her escape in books and, later, films. Her predilection for faking reality as an adult first emerged in the conflict between the reality of her husband, Frank O'Connor, and her image of him. The extent of her dependence on amphetamines is peripheral, but a good way to get a really distorted sense of reality is to swallow a couple of Dexedrines. 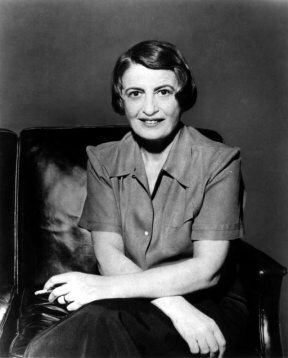 By insisting that Objectivism had sprung full blown from her own mind, with just a little help from Aristotle, Rand was being childish, as well as out of touch with reality. Rand got a few huge truths right, and expressed those truths in her fiction so powerfully that they continue to inspire each new generation. They have only a loose relationship with Objectivism as a philosophy. First, Rand expressed the glory of human achievement. She tapped into the delight that a human being ought to feel at watching another member of our species doing things superbly well. Second, Ayn Rand portrayed a world I wanted to live in, not because I would be rich or powerful in it, but because it consisted of people I wanted to be around. The novels are what make Ayn Rand important. Better than any other American novelist, she captured the magic of what life in America is supposed to be. AR I guess you could say that Atlas Shrugged is the Great American Novel of literary legend. Eat your hearts out, Philip Roth and all you other scribblers.